Almost on a daily basis, I receive emails that go something like " What is the maximum load for my Ruger Blackhawk?" The model of the gun may vary. It could be a Smith & Wesson model 19, a Colt Python, Browning A-Bolt, Winchester model 94, or almost any other cartridge firing weapon. For some reason, the shooter wants to stuff his firearm with the elusive "maximum load". Why the shooter wants to run his weapon at the edge of destruction is beyond me. I guess that the simplest way to find the maximum load for any given firearm would be to incrementally load more and more powerful loads for the gun, and start firing them in succession until the gun blows up. The last cartridge that did not blow up the gun was the maximum load. The problem with that method is that you have destroyed the weapon, and the information gained by doing so will not apply directly to a gun of like make and model. Due to differences in manufacturing tolerances for firearms, each gun is a law unto itself. A load that works fine in my Ruger Vaquero might give excessive pressure in yours. Even if the "maximum load" did not blow the weapon to pieces, it could, over time, beat the gun to death. If you have an automobile with a tachometer, you will notice that it is marked, usually with a red line, the maximum RPMs that the engine will run, yet no sane person wants to run his engine constantly at redline. The life of the engine would be measured in minutes instead of years. It is the same with a firearm. A quality gun with normal use will give service for several generations, yet constantly subjecting the weapon to excessive pressure will beat the gun to death. Every time that the gun is fired, stress is placed upon not only the chamber but the frame and certain internal parts. Modern guns are very strong and built to withstand these stresses, but constantly running the gun at peak pressures will gradually shoot the gun loose. In certain designs of revolvers, such as the Smith & Wesson, the frames will stretch, resulting in excessive tolerances, bad timing, and misfires. Run these same guns with ammunition for which they were designed, and they will last for years. Let us examine the case of rifle cartridges and excessive pressure. Modern bottle-neck cartridges are made to perform at high pressure, and the rifles in which they are chambered are very efficient at converting that pressure into a very flat shooting and accurate package. Loading ammunition near peak pressure can result in good accuracy and velocity, but exceeding the working pressure of the rifle and cartridge results in erratic velocity, poor accuracy, and sticky extraction at best. At worst, it can wreck your rifle and result in bodily injury. Most normal human beings are issued two eyes at birth, without the option of acquiring more later. Excessive pressure in a rifle can result in hot powder gasses streaming at high speed into the shooter’s face. It is a very good way to lose an eye, and only to obtain that mysterious maximum load. For some reason, many shooters want the most velocity possible with any given bullet. Sometimes this is a good thing, and sometimes it works against the purpose for using the gun. For instance, a bullet designed to work well at 30-06 velocities will blow to pieces if fired into a game animal at close range from the latest and greatest .300 Ultra Short Nuclear Fat Magnum. The recent craving to push .30 caliber big game bullets at .22 varmint bullet velocities makes the big game bullets behave like varmint bullets at close range. I know of hunters who are trading off their .300 Winchester Magnums for .300s with greater case capacity to obtain a couple of hundred more feet-per-second velocity, to go deer hunting! This is why a hunter using one of these super .300s needs to use only premium, bonded core bullets so that they don’t come apart upon impact. Make no mistake, these new super magnums offer flatter trajectory, but that is about it. Sometimes they offer less penetration than if the same bullet were moving slower. This is the same rationale that makes shooters want to stoke their guns with "maximum" loads. They mistakenly think that pushing the bullet faster results in better performance. This is just not always the case. It is not only hand gunners and riflemen who suffer from "maximumitis". Shotgunners also have their version of this malady. The reason that the twelve gauge 3 ½ inch shell is so popular is because no one makes a four inch shell. A turkey or waterfowl is killed by two or three well-placed pellets to the vitals of the bird, but shot gunners want to throw as much lead out the barrel as possible. It has been proven that pellet speed is more important to penetration than any other factor. Throwing more pellets does nothing to improve penetration. 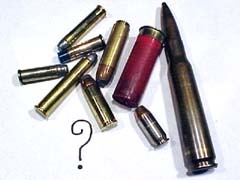 A lighter payload at faster speed is a more effective load for a shot gunner who can shoot accurately, yet most hunters want to throw as many pellets as possible at the target. When Ruger and Hornady introduced the .480 Ruger cartridge and gun, many hand gunners lamented that it wasn’t a .475 Linebaugh, as if a 325 grain bullet at 1350 feet-per-second wasn’t enough. Handloaded, the .480 can push a 405 grain hard-cast lead bullet at 1300 feet-per-second. Let me tell you that this load can kill anything that bleeds, yet many cried that this was not enough! The .475 Linebaugh is a fine cartridge, but it is not for everyone. The guns are expensive and the recoil substantial. I have even heard from shooters wanting to know the "maximum load" for the .475 Linebaugh! Most likely, these shooters had never even fired one. All of this brings us to the point of this article. Your firearm, any firearm, will give longer life, better performance, and greater accuracy if fed a steady diet of quality ammunition, whether factory or hand loaded. Handloads should be worked up from reliable load data to a load which gives good velocity and accuracy with any given bullet. Many times the most accurate loads are just below those that offer the fastest velocity. I will take accuracy over a few feet-per-second any day. I have a load that will, from my Browning 30-06, group three Hornady 150 grain Spire point bullets into a tight cluster year after year, and it also gives top velocity and easy extraction. I could most likely push that bullet even faster in this gun, but I won’t. It would offer no better performance. It is the perfect whitetail deer load for my rifle. It may give lousy accuracy and excessive pressure in your rifle. Guns are individuals, and should be treated as such. Many handloaders are looking for an instant answer rather than working up the best load for their individual gun. The best load for your gun is found with patience and deliberation. These days, we want instant everything. We tap our fingers in anxiety waiting on the microwave. If internet downloads take more than ten seconds, we go spend two thousand bucks on a new computer that can do it in five seconds. If you are in a hurry to find the best load for your gun, you are better off with factory ammo. Every handloader should have several load data books, and read them. Compare data. Look at some of the better loads, and slowly work your way up to one that gives good performance and accuracy with the bullet of your choice. This is the best load for your particular gun. Maximum velocity is not necessarily maximum performance.